Northland is a personal and architectural obsession of mine. If you want back story and photos, go here. An architect pal o’mine understands my obsession, and I thank him for publishing wreckage updates when I couldn’t bear to. In this space, I will visit various aspects of Northland’s demise, but for this moment, some hard news. 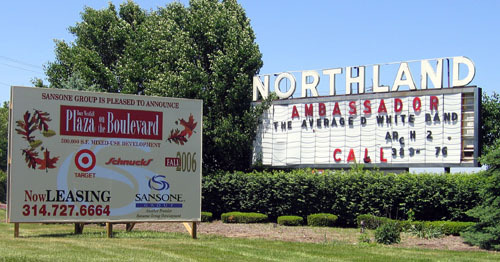 Wednesday, June 15th was the Ambassador’s last night of business at Northland. They are still trying to find a new location, and are even contemplating building a new place from scratch since relocating has turned into more of a hassle than anticipated. As Northland dies and Buzz Westfall’s Plaza on the Boulevard rises from the ashes, Sansone is actively recruiting tenants to fill in the details of what Target and Schnucks will anchor. The Ambassador (and a subsidiary of Spruill’s International Catering) wanted to sign on with the Plaza, which seems like a win/win situation for all parties involved. London’s Wing House – a successful outlot building nestled right into the West Florissant and Lucas-Hunt corner – must also leave (and this, after the owner dropped a big chunk of change on remodeling). The Ambassador, Spruill’s and London’s Wing House are privately owned minority businesses with a sizeable and loyal clientele. They kept Northland alive for the last several years. But they are not corporate chains, so they are not welcome at Buzz Westfall’s Plaza on the Boulevard. Even though this news doesn’t shock me, it still really pisses me off. This entry was posted in demolished, historic architecture, mid-century modern commercial, north county modern, north st. louis county and tagged jennings mo, northland shopping center by Toby Weiss. Bookmark the permalink. So many memories….as a child i new christmas was near when the candles went up AFTER thanks giving but now christmas deocorations start in october. As a teen bought my first rock albums (1974) BTO’s and KISS’s first album. Shopped at radio shack,dinner at walgreens,bought Big Red tickets and me andy cousin took the red bird express to many cardinal baseball games. Are there any photos of Christmas @Northland with the Red Candles. I keep looking..probally just not at the right place or site. I think about the candles every Christmas! Oh my does this site bring back memories! I grew up in the 60’s in Jennings and lived close to Northland. I spent a lot of time there Famous, Kresge and the bowling alley. I worked at Famous as a teenager. I thought that store was amazing. The behind the scenes things for the employees I still think was pretty amazing. There was a big employee only cafeteria, lounges with recliners and did you know that there was a fallout shelter built under the Famous building. I guess being built in the 50’s that was the thing to do. I’m not sure who they were going to save though. I have seen the new Westfall site and they did a great job. It is roomy and clean. It’s defitely not the same as Northland but it is very nice. Thanks for putting up your webpage and letting everyone share their memories. Sure brought back a lot for me. One of my oldest was me and a friend being driven by his mom to go see King Kong at the theater there. It’s a crime that those architecturally significant buildings including the theatre were destroyed. One can easily imagine what kind of cheap and ugly temporary looking structures replaced it. I remember the Big Red candles ( Electric ) with yellow flames that told everyone the holiday season had started. July 4, was also a big time with a free fireworks display. I worked at Northland Music as a teacher back in the 1970’s. I had studied at Northland Music as a Child in the mid 60’s.Lived in Northland Hill Subdivision until the late 1960’s.My parents took a van load of my friends to the Northland Cinema for my 10th birthday–which was a big deal in the 60’s!!! My father worked across the street from Northland for a few years at Emerson Electric before he started his own business just down the road. His V.F.W. Post was a few blocks away from Northland.Missed Saturday bowling very few times in the 60’s. Very sad to see it go. I return to this sight over and over again. Can’t get enough of the images. Memories, my earliest, involves an early taste of showbizness. Costello Kunzee Ford was hosting a display of new cars on the upper level, close to Walgreens, and as a little boy I was asked to demonstrate the convertable roof of a new model, probably 1960 or so. Ah! The lovely model who helped me into the car! I was about seven or so. I remember Northland when it was still a decent place and saw it’s downfall. Always giong by there in the winter and seeing the snowflakes lit up on teh side of Famous Barr during the Christmas season. Friends and I slept outside of Famous for Metallica tickets( in 1993 ). Our gym class use to go on a field trip to the bowling alley. The crime from Jennings and the city just ruined the mall. So Long Northland. Spending Saturdays at Kresge’s downstairs diner. Pie carousels and the balloons that hung from the ceiling. Inside the balloons was a chance to win a banana split or perhaps just a coupon on a sundae. Awesome french fries. In junior high there was a Reaganomics surge in retail. Quite a few new stores came but did not last. Didn’t matter to us, we’d spend all day hanging out if the weather was good. Got Lou Brock’s autograph in the basement at Famous-Barr next to the snack bar. Spending hours in Walden books was heaven, and they never chased us out. And lastly, running through Famous, up three fights of escalator to the customer service/ticketmaster desk (on the third floor of course) in the back by the records to get concert tickets. (U2-Joshua Tree tour) (R.E.M.-Green tour) etc… don’t really know why we ran, usually there were line tickets to save your place, but we always ran. Good times…thanks for saving the memories in stills. P.s. my junior high school history/english teacher had photos of the construction, don’t know if he’s still alive and/or if you are interested. I grew up in Jennings, and spent a lot of time at Northland Shopping Center. Going to the twenty-five cent movies at the Cinema on a Saturday morning, then to Kresge’s diner to grab a rootbeer float. At Christmas time, It WAS the place to be, Filled wall-to-wall with shoppers, every store was open and all did a booming business. On the corner of the lot was a Miniature Golf that we played often. That was back in the 1970s. A lot of childhood memories! I always had high hopes that Northland would be restored somehow, but now it’s completely gone. It’s a piece of history that lots of people from this area will remember for a long time to come. This is a GREAT sight for malls of the past! 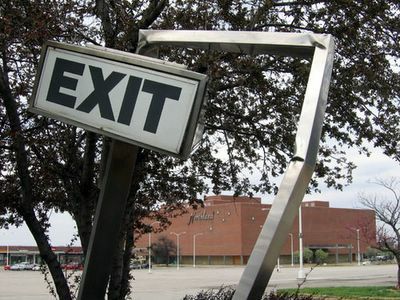 It’s great to see that people are interested in keeping the memories of the old malls alive. Keep up the good work!! You are 100% correct on all of your points made here. It is quite refreshing to see others have an interest in these “old” buildings and malls. There is NO FREAKING way Northland should have been demolished. Some people just have no vision. I wish I had big money, I’d be buying a lot of these old malls.